Home / MBA Studies / Measurement in Business and Management / Term 1 / Is formal education killing our right brain? Is formal education killing our right brain? Back at the MBA classes at PIM, Dr. Travis Perera’s first two lectures for the subject “Measurement in Business and Management”, covered a very interesting area of study, about the human brain. The brain dominance theory, derived from various research studies including many split brain research, is the stage setter for this subject, as per the course outline. Today, I just completed reading all the recommended reading materials for the topic “Left brain and right brain thinking”, and it was simply amazing to understand how our brain works. As in theory, our right brain provokes our creativity and imagination, while the left brain push us to be “more rational and organized”. Naturally, people tend to be either right brain dominant or left brain dominant. Our left brain, will always try to intervene with the right brain, asking logical questions like “why so?”, and trying to rationalize everything. On the other hand, our right brain always try to break the limits, by asking “Why not?”. If a person’s left brain manages to override his right brain in majority of the cases, we call him as a “Left brain dominated person”. The same thing apply for the other half of the brain. Left brain dominated people are often, more logical and rational in decision making. They seek sequences in everything. They want proof to believe in anything they come across. On the other hand, the right brain dominated people are more intuitive. They follow their natural instinct, more than the logic and rationality. In most cases, the two halves of the brain work in harmony, when a person needs to solve a problem. 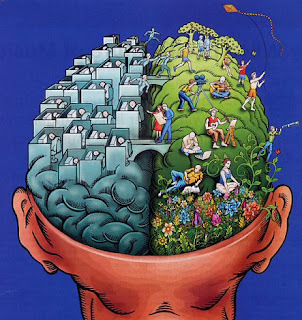 The left brain analyze the things that a person see and experience in and around the environment. Suddenly, his right brain start noticing a “flash connection” between two logically unrelated concepts. This “flash connection”, what we call as the “idea generation” is very important in solving a problem. This can be the starting point of a new business idea, a new product innovation, an award winning advertisement, a story for a blockbuster movie, or a hit song selling all over the world. Once the idea generation part is done by the right brain, then again your left brain takes control of the idea, to evaluate it’s feasibility. Your left brain starts questioning the rationality, logic and feasibility of the new idea that generated by the right brain. Ever wondered why some of those people in your company, who always asks too many annoying questions about your brilliant new idea? Well. Now you know the answer. Their left brain is dominant over their right brain. And if you think thoroughly, they are wither from the accounts department, or from a department which involves a highly structured work envirnment (Quality control, production, corporate planning etc). You cannot argue that, one half of the brain is better than the other. We need the strengths of both halves of the brain, depending on the situation where it requires. Of course, you cannot work in your right brain, when you are doing the annual accounts for your company, or evaluating a partnership proposal by another company. At the same time, you cannot let your left brain to dominate, when you try to come up with the next brilliant marketing idea to lift the sales up by 20% for your company. The things that I've learned so far about the split brain theory suggest me that, right brained people are the one’s who can make a difference in the world. A developing country like Sri Lanka, needs more right brain thinkers, to come up with new ideas to solve the problems of the country. Lack of right brain dominated people is reflected in the performance of our country in sports (other than Cricket), arts, and entrepreneurship. How many world class athletes have we produced after our independence? I would say none, while some people may mention the name of Susanthika Jayasinghe. But, only Sri Lankans know about her, so she’s no “world class”. ( It’s true that you don’t have to come first, to win in Olympics. But you have to come first, to be remembered by others, in any game). How many world class artists have we produced? How many world class movies? How many world class entrepreneurs do we have? Answer is “very few” if not, “not at all”. My left brain ask the question “Why?”. I think, this comes from our education system, and our traditional education system is designed to produce “doctors, engineers, and lawyers” but not “athletes, artists or entrepreneurs”. From the grade one, our education system discourages the right brain activities of the students, (By having a well structured class room) and slowly and steadily they are cornered towards a one side of the brain. They are forced to learn things that they are not really born for. And there’s no proper technique used, to identify the proper orientation of a student’s brain, and direct him to a field where more suites him. Without understanding this, our education system push all the students towards the competition for becoming a doctor, engineer or a lawyer, but according to the natural principles, only the one’s who designed to be in those professions, will win this competition. Then, our education system throws the rest to the society as “failures” (In GCE A/L), and the society gives them the lable “moron”. But, if properly executed, our education system can change these “morons” into world class athletes, or world class artists, or world class entrepreneurs. The problem with this country is not the seeds. It’s the soil! I just ran into this article, imagine - two years later, and am thrilled of what you have said and expanded on the session I did. Sadly, we dont to the Measurement module any more at PIM. However, Its components are now distributed over the entire MBA course.